The appetite for immersive events continues unabated and with The Tanks opening soon at Tate Modern the opportunities for creating events that plunge guests into new sensory and visual experiences has taken another exciting step forward. For private events these spaces will provide a blank canvas for organisers to create environments for their guests to discover new stories and to get closer to brands or products. Around London, ‘found spaces’ are providing ever more elaborate backdrops to create events. Recently, Moet & Chandon created a landscape in Soho to transport guests into a 360 degree virtual reality experience of their vineyards and cellars where they could discover the science of champagne blending and maturation, followed by a tasting of the Moet & Chandon full range. Last year ‘Lemonade and Laughing Gas’ took over two floors of a multi storey building in Farringdon where ticket holders could experience an immersive dining experience inspired by the world of Twin Peaks, sup on three courses of classic American diner food with a twist, enjoy bespoke themed cocktails and wander through Double Pineview’s very own slice of Small Town America. For those mourning the end of one of the most brilliant shows on TV, ‘Breaking Mad’ provided an opportunity to take part in an immersive drinking experience at Truman’s Brewery, for eight nights you could enjoy cooked cocktails and sensory explosions and get a glimpse into the lives of your favourite TV characters. Finally, Gingerline was back with a bang with their Chambers of Flavour, a steampunk-drenched crazy supper club in a secret location in East London where guests were guided through different ‘dimensions’ – one to match each of the four courses – all of which featured performance, stunning sets and fantastic food. The magnificent raw Tate Tanks are the world’s first museum space to be dedicated to live performance art. A unique setting for artists’ installations and performances including dance, music, the spoken word and film. The new Tate Modern will open on the 17th June with a busy programme of live art; in the autumn and winter months entertaining will be possible in The Tanks and with that will come the exciting opportunity to generate and create new landscapes and environments for immersive experiences. The South Tank has a phenomenal height of 7 meters and a diameter of 30 meters and will give a breadth of blank canvas space that will showcase an equally large scale creative vision. Many of Private Drama’s recent events would have worked brilliantly in The Tanks. The transformation of a car park into the town of Seville for an experiential performance of Bizet’s opera Carmen or the refashioning of a church to create a fire and water environment for an immersive gala inspired by the ballets Swan Lake, Firebird and the Dying Swan. In addition, the inclusion of good infrastructure such as lighting bars and dressing rooms as well as great acoustics make these monumental spaces very much fit for theatrical purpose. Another project currently in development at Private Drama for a client is a performance piece called Being Andy Warhol. What better space than Tate Tanks could there be for us to stage this event and allow guests to discover what it was like to walk through The Factory, surrounded by drag queens, celebrities, musicians, radicals, movie stars and writers. With incredible attention to detail we will recreate the Factory where one person at a time will spend exactly fifteen minutes wandering through the space interacting with our cast and being treated like Andy. With film makers around every corner, The Velvet Underground blasting out on speakers and people making out on the couch, this will be a voyeuristic, highly theatrical and mind bending glimpse into a unique moment in time. 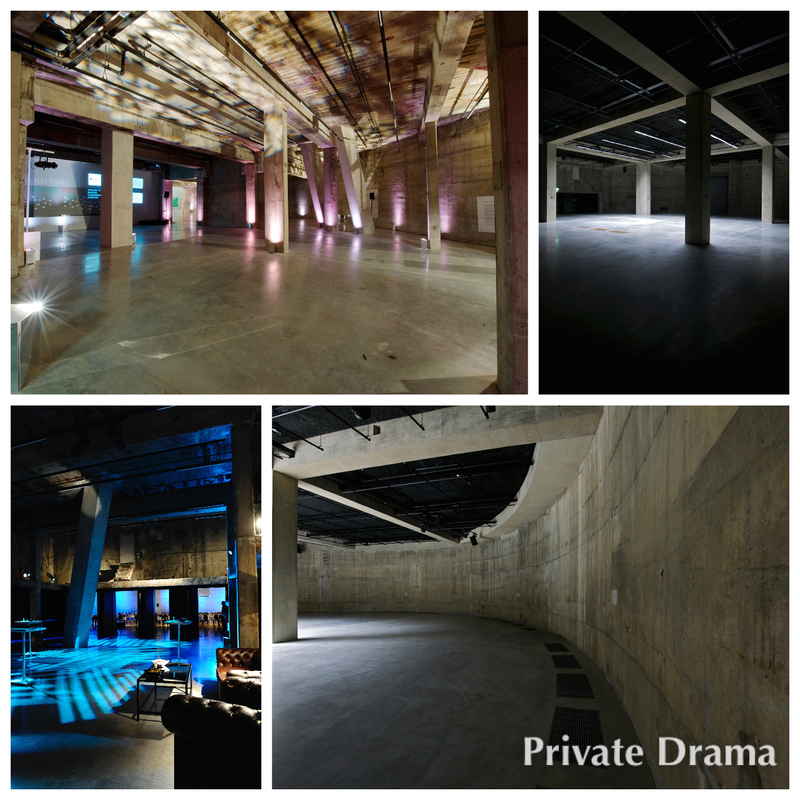 Be it live art or immersive experiences these underground Tanks will provide one of the most extraordinary and exciting new spaces in which to stage events.